Hello!! I've been sporadically attending events here and there (depending on how my pregnant self feels) and I wanted to share some of my fave pictures that hadn't made it to the blog! Here are some maternity and non-maternity outfits and snapshots that were share-worthy, especially because some of the pieces are now on mega-sale! A couple of weeks ago, I went to a chic Hawaiian themed bridal shower, so in sticking with the theme I wanted something flowy, bright and of course bump-friendly! This dress definitely did that for me. How cute are the table settings! Now let's back track a few months back, to the day after I found out I was pregnant and had no idea I would be hit with morning sickness and out of commission the week after. Cafe Gratitude invited me and a girlfriend (Kali from In Spades blog) for a girls' lunch. 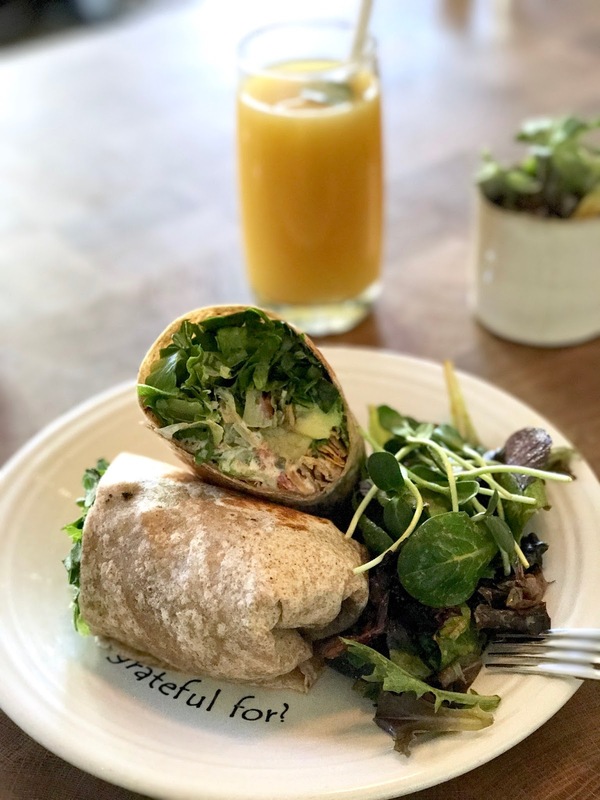 Aside from the delicious plant-based gourmet food, Cafe Gratitude has so many instagram-worthy spots (their tile, their plates, their decor)! It was nice to catch up with Kali and know that what I was eating was healthy and preggo-friendly. Their tile is one of my fave parts so a top down shot is a must! So then shortly after the above, the pregnancy symptoms started to rock my world! I had all these plans that I had to cancel, like a trip to Arizona with my friends at Toyota and even a couples trip to New Orleans with my bestie and her husband. I was so scared that I would also have to miss fellow blogger Vanessa Balli's wedding in Palm Springs. I had been sick all week and the day before, I felt ok enough to be in a car for over 2 hours (hubby packed me Gatorade, crackers and snacks). Thank God I held it together for a day and a half and I didn't miss it, it was such a beautiful wedding! And then, I couldn't hold it together for a few months, so I disappeared off the face of the earth... no really, you probably noticed tumbleweeds blowing through my blog and all of my social media platforms. But then I started seeing a glimmer of hope, I started to have more better days that not and finally was feeling well enough to walk around and go to the stores. The hubby who usually makes a face when I ask him to take my picture (he refuses to be an Instagram husband), actually smiled when I asked him to take my pic because he knew that was an indicator that I was feeling better. During my pregnancy I received the most beautiful poster of our beloved San Diego from Modern Map Art. The hubby hung it in our bar cart nook which was the perfect spot for it in our home. It comes in different colors, but I love that this just looks classic in black and white. The quality of the poster is also superb, it's thick and has a velvety texture on the black area. If you're looking for high quality posters at an affordable price I highly recommend this company! And then came time to reveal the gender on social media! I had thought about having a gender reveal party, but I wasn't feeling up to hosting yet, so hubby and I had the doctor tell us at one of our appointments. She said, "one day your baby is going to be a big brother!" Hubby and I just looked at each other in shock and we stayed in that state as we walked out of the building. A couple of weeks later we had the anatomy ultrasound and sure enough, he's definitely a boy! lol. I held off telling people as long as I could, but since everyone kept asking I decided to put together a lil Instagram photo op (below) to announce that "It's a BOY!" And so the bump became obvious and I could start doing the pregnant pose. The pic below was taken in what is to be the nursery. Hubby had just painted it a very light shade of blue (on the second try because first blue we had chosen was a pastel blue). And as he painted, it became more real, I had to stop and admire how momentous it was. PS. Once the nursery is completed I will for sure share! All of your pictures are so lovely! That purple dress is super pretty.